David McDowell doesn’t like being put in a box. That’s one of the reasons why, after earning a doctoral degree in mechanical engineering from the University of Illinois at Urbana-Champaign, he headed south to begin his career at Georgia Tech. He said he wanted a place where he could exert his vision and leadership from an early stage. That was in 1983. Now, 36 years later, McDowell, Regents Professor and Carter N. Paden Jr. Distinguished Chair in Metals Processing, will receive Georgia Tech’s highest award given to a faculty member: the Class of 1934 Distinguished Professor Award. The award recognizes outstanding achievement in teaching, research, and service. Instituted in 1984 by the Class of 1934 in observance of its 50th reunion, the award is presented to a professor who has made significant long-term contributions that have brought widespread recognition to the professor, to his or her school, and to the Institute. He will leave much more than a trace. Over the course of three and a half decades, McDowell has done groundbreaking research in developing new techniques and methods for measuring, understanding, and modeling the way materials behave and how to use this information to improve the performance of products that benefit everyday life in areas such as transportation and energy production. He has produced more than 500 published papers or book chapters as author or co-author (including more than 335 refereed journal articles), and more than 600 presentations. For 20 years he served as director of the Mechanical Properties Research Laboratory, a major university laboratory in experimental fatigue and fracture research. 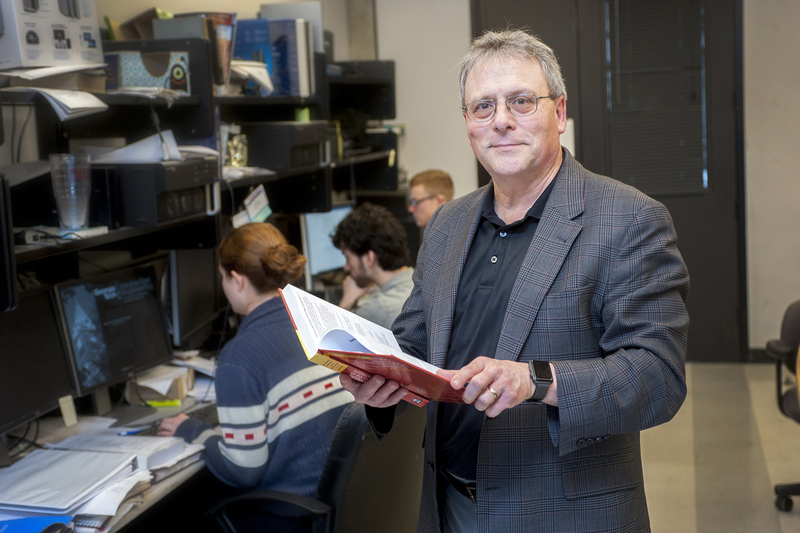 And, he is the founding executive director of the Institute for Materials, serving as a driver of the development and growth of materials research and education at Tech. But he is proudest of advising or co-advising more than 30 master’s students and 51 doctoral students through degree completion. Professor David McDowell with students during a National Robotics Week tour of his lab in 2018. Pictured (L-R): Adrienne Muth, Aaron Tallman, McDowell, Dengke Chen, Theodore Zirkle, and Krzysztof Stopka. McDowell said the academic environment is unique because as a professor he can stay young intellectually by interacting with people who are in the throes of defining their area of greatness. “That’s an inspiration to be around people who have their future ahead of them, and they’re trying to chart that path. I’m helping them to do that by helping them refine the precision and creativity of their thinking. To me that’s remarkable. That’s what a professor does," he said. When further describing his role as a professor, McDowell makes a point of putting his words in a particular order. “Professors have two major responsibilities. One is to develop and cultivate new ideas. The second is to cultivate and develop people, specifically students that you help guide in the early stages of their career,” he said. He estimates that 33 percent of his former doctoral students are working in industry, 40 percent are in academia, and the rest have careers in government research labs. “I have a knack for guiding people who have an inclination for academia,” he said. But, he doesn’t steer students in that direction. Instead, he lets them explore and find areas where they may become world-class. 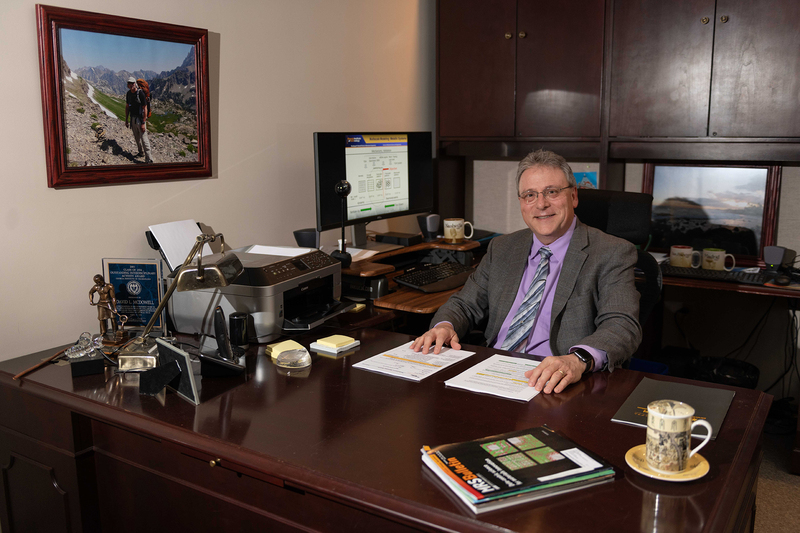 McDowell in his office at the Renewable Bioproducts Institute. McDowell pointed out that today it’s relatively easy to have students being shared among departments, and faculty collaborating among departments. In a way, Tech is leading the way in how research and education are conducted across academic disciplines. The challenge is to create an environment where young people with good ideas can find support for their vision and their leadership.